The eruption at Sarychev Peak in the Kurils appears to be on the wane, with no visible emissions cloud reported in the latest Volcanic Ash Advisory from Tokyo VAAC, issued at 02:52 GMT yesterday, 23 June 2009. The Sakhalin Volcanic Eruption Response Team reported a steam and gas plume extending 120 km south of the volcano on 20 June, a ‘high’ (1.5 km altitude) steam and gas emission stretching 7 km north-west and an intense thermal anomaly on 21 June, a steam and gas plume extending 29 km north at 1.5 km altitude on 22 June, and a 9-km-long steam and gas plume extending north-west and an intense thermal anomaly on 24 June. Incidentally SVERT also notes possible ‘increasing of steam-gas activity’ at Severgin volcano in its 22 June bulletin, and a thermal anomaly at the same volcano on 24 June. Severgin was the central cone of a volcano on the island of Kharimkotan in the northern Kurils, which destroyed itself in a VEI=5 eruption in 1933. This, the GVP notes, was ‘one of the largest [eruptions] in the Kuril Islands during historical time’. The island shows evidence of repeated slope-failures and collapses precipitating debris avalanches into the sea. The 1933 collapse of Severgin produced a tsunami that reached Paramushir, ~150 km to the north. Posted by admin in activity reports, eruptions, NASA Earth Observatory, natural hazards, Russia, Sarychev Peak. 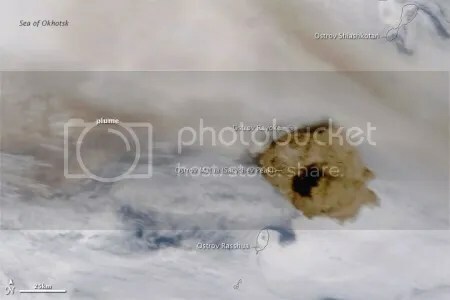 The ongoing eruption of Sarychev Peak in the Kuril Islands has produced a very large cloud of sulphur dioxide – indeed, the largest sulphur dioxide event this year, reports the NASA Earth Observatory in their commentary on the above image. The Earth Observatory also remarks that some satellite data indicate that the Sarychev Peak plume reached 10-15 km altitude, and may have reached as high as 21 km. Tokyo VAAC is still reporting ’emissions continuing’ with Sarychev Peak ash reported at 32000 feet/9750 m altitude, and the eruption continues to disrupt flights through the North Pacific air corridors. There have been no updates from SVERT since that of 16 June. 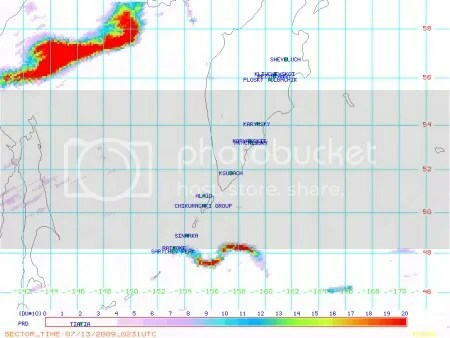 There has been no fresh update on Sarychev Peak from the Sakhalin Volcanic Eruption Response Team since yesterday, but the eruption is clearly ongoing: today’s volcanic ash advisories from Tokyo VAAC report emissions continuing, and ash at flight level 320, which is 32000 feet/9750 metres (17 July 2009 18:00 GMT). The NASA Earth Observatory is doing a wonderful job of bringing us stunning satellite imagery of the Sarychev Peak eruption. 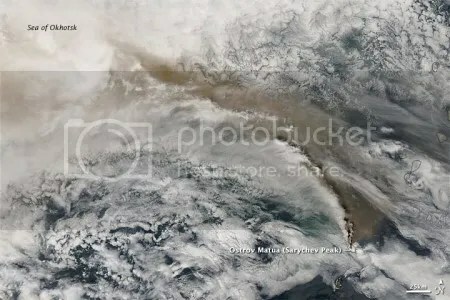 The latest satellite image comes from the Moderate Resolution Imaging Spectroradiometer (MODIS) on NASA’s Aqua satellite and shows the volcano’s plume of ash and steam stretching across the Sea of Okhotsk in an elegant curve. Greenish ashfall is visible in the sea below and to the west of the plume. Over at Eruptions Dr Erik Klemetti has a valuable Sarychev update today, including information about the possible future behaviour of the volcano’s plume from Washington VAAC and more news on flight disruptions caused by the eruption. 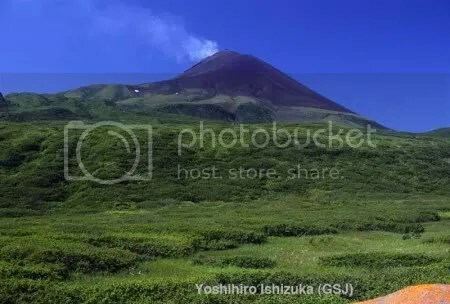 The following pictures were taken by Dr Yoshihiro Ishizuka of the Geological Survey of Japan, which is part of the National Institute of Advanced Industrial Science and Technology (AIST), during research visits to Matua Island, where Sarychev Peak volcano is located, in 2008. 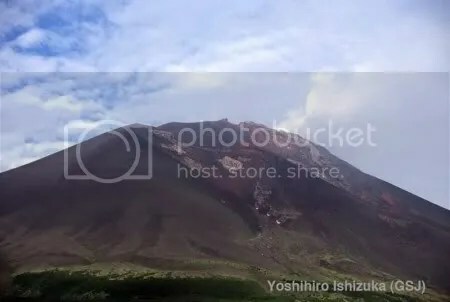 There is a further selection of pictures of the volcano on Yoshihiro Ishizuka’s Sarychev Peak page at the AIST website, showing the general aspect of the place before the current eruption began. These pictures are copyright Yoshihiro Ishizuka (Geological Survey of Japan, AIST) and are reproduced here with permission. The Volcanism Blog is very grateful to Dr Ishizuka for granting permission for the reproduction of these pictures. Above: Matua Island and Sarychev Peak from the south-east, August 2008, with weak fumarolic activity visible at the summit (copyrighted photo by Yoshihiro Ishizuka, Geol Surv Japan, AIST). Above: The volcanic cone of Sarychev Peak, August 2008 (copyrighted photo by Yoshihiro Ishizuka, Geol Surv Japan, AIST). Above: Sarychev Peak volcanic cone, looking south (copyrighted photo by Yoshihiro Ishizuka, Geol Surv Japan, AIST). The picture below was taken on an earlier visit in 2000, and shows tephra layers from the southern end of Matua Island. The scale bar is 1 metre in height. 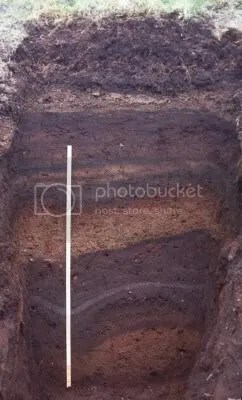 At least 19 tephra layers can be identified, composed of pumices, scoriae, ash, and pyroclastic flow deposits, most of them probably from eruptions of Sarychev Peak. An annotated version of this image and accompanying discussion can be found in Yoshihiro Ishizuka, ‘Volcanic activity and recent tephras in the Kuril Islands: field result during the International Kuril Island Project (IKIP) 2000’, available at the IKIP website. Above: Columnar section of tephras at south end of Matua Island (copyrighted photo by Yoshihiro Ishizuka, Geol Surv Japan, AIST). Posted by admin in activity reports, eruptions, NASA Earth Observatory, Pacific, Russia, Sarychev Peak. The Earth Observatory caption for this image suggests that a fresh burst of activity was captured in this shot, with the brown cloud of ash forcing its way up directly over Matua Island, where the volcano is located, in a mass some 50 km in diameter. 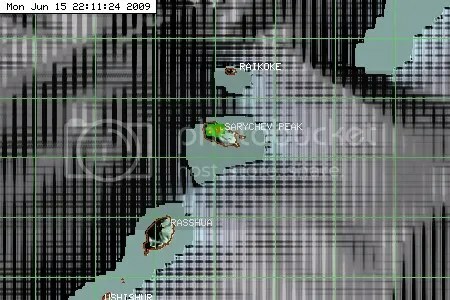 Check out the original page for this image at the Earth Observatory (which also has a nice credit to The Volcanism Blog – always appreciated) to find out more, and for links to more Sarychev Peak imagery. Tokyo VAAC has been issuing advisories consistently reporting an ash cloud reaching around 10-13 km altitude from late yesterday into this morning. The latest Tokyo Volcanic Ash Advisory at the time of writing, issued at 08:52 GMT this morning, reports ash between 32000 and 45000 feet (9750-13700 metres). 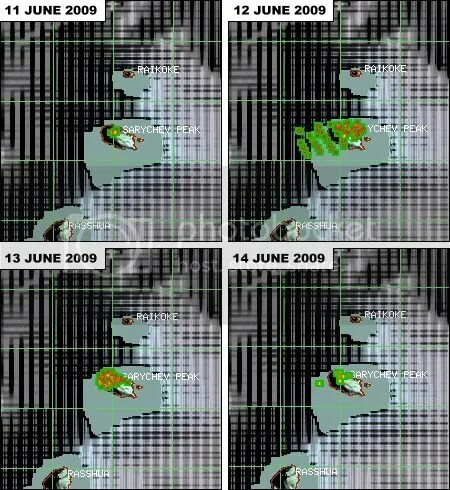 The MODVOLCS thermal alerts monitoring website shows continuing significant thermal anomalies on 15 June (above). This may represent fresh lava flows, or it could be just the presence of hot ash in the plume. Earlier imagery of thermal anomalies can be found in our post of yesterday. 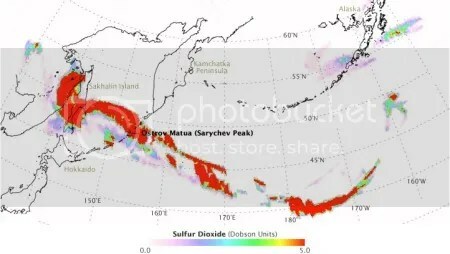 The emissions cloud from Sarychev Peak is causing significant disruption to the north Pacific air corridors. Information and links (and personal experiences!) 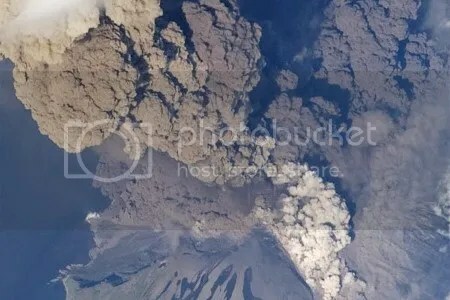 of diversions and delays can be found – along with a great deal more coverage of the eruption – at Dr Klemetti’s Eruptions blog: Eruption at Sarychev Peak threatening air traffic, Sarychev Peak eruption update for 6/15/2009. 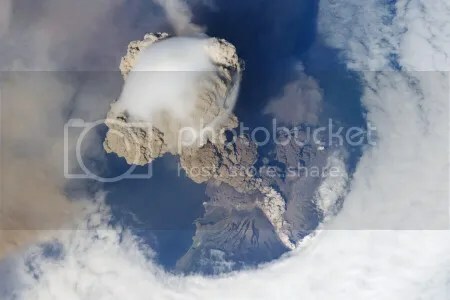 Meanwhile, top Russian volcanologist Alexander Rybin is quoted in a report in Vostok Media (illustrated with a stock picture of Some Random Volcano) as calling this eruption ‘the greatest volcano eruption registered in the Kuril Islands’. 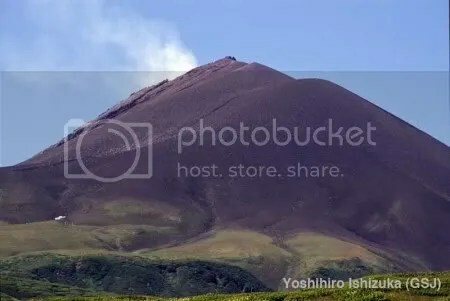 UPDATE: Following some incoming links back to their sources I found my way to this Japanese page which has many photographs of Sarychev Peak from 2007 and 2008. 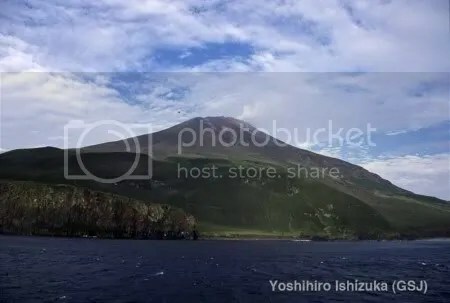 The Sarychev Peak page, part of the website of AIST (the National Institute of Advanced Industrial Science and Technology), comes under a survey of the Kuril Islands volcanoes.